If you ask any parent, it can be challenging, cumbersome, and downright frustrating trying to ensure your young child is brushing his or her teeth properly. When they are young, brushing their teeth for them and trying to explain the process can seem as impossible as trying to wrangle cats! If this sounds familiar, rest assured that you’re not alone! In today’s article, we’ll provide a few tips designed to help get your child into a good brushing routine. 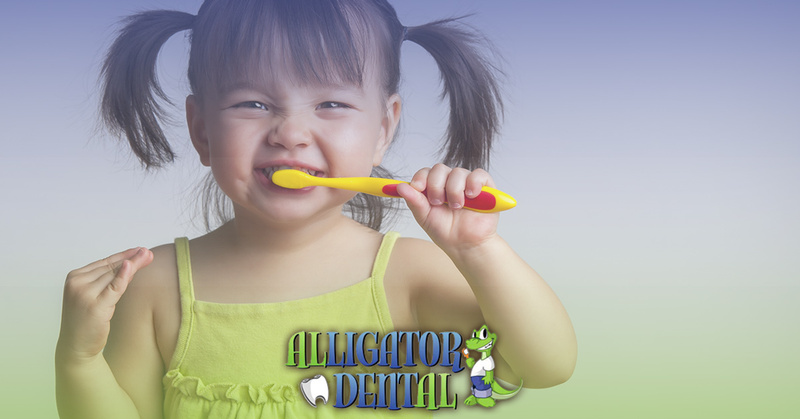 At Alligator Dental in Seguin and San Marcos, our pediatric dentists provide fun, patient-centered dental services, and we’d love to meet your family if we haven’t already! If it’s time for your child’s check-up, or if he or she has some kind of dental complaint, call us today! Consider incorporating a song into their brushing time. A quick search on the internet will give you a few ideas, or you can get creative and make up your own with your child for added fun! Purchase a toothbrush and toothpaste designed for kids. You can find these in any supermarket or drugstore, and your child will love that his or her favorite cartoon character is part of the action. Stay positive. We know it can be pretty frustrating trying to teach your kiddos how to brush their teeth. Remember to maintain a positive outlook; kids can easily sense tension and you don’t want to make your child anxious. If all else fails, make a game of it. You might consider starting the session with a staring contest or goofy faces in the mirror. Lightening the mood can help your child relax and be more receptive to a new activity. Children love to mimic what their older siblings and parents do. Inviting your child to watch you brush your teeth every morning and night is a good way for them to watch how you do it and spark their curiosity. Likewise, your kiddos will also pick up on proper brushing habits as they watch you. 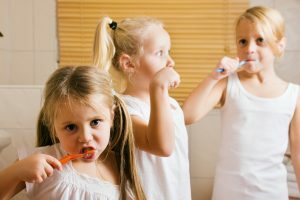 Speak with older siblings about the importance of modeling good brushing habits when the younger siblings are around. If everyone in the house is doing something that your little one isn’t, chances are that he or she will want to join the club. There’s no better way to develop a good habit than practicing it over and over again. Consider having your child brush his or her teeth in the morning after making their bed and getting dressed. At night time, encourage brushing after bath or story time. The key to any routine is consistency. When your kiddo incorporates brushing as a part of his or her regular morning and night routine, they are more likely to stick to it. Before you know it, brushing their teeth will be second nature for them, and you won’t have to harp on them to get it done. At Alligator Dental, we make going to the dentist fun! For more tips and tricks, contact one of our offices and speak with a member of our friendly staff. Our pediatric dentists take your child’s dental health very seriously, and we want to do everything we can to help them take care of their pearly whites. We look forward to speaking with you!